This is the first time I have seen this film, and was so excited about that reality. I love adventuring into films I have never seen. This is a movie that shines in many ways, from the cinematography, to acting and most of all direction. This 1970 film brings a historical setting to life in vivid ways. Now this is not necessarily a sequel, but this takes place 40 years after the movie Hawaii, which came out in 1966. Twilight Time has also brought Hawaii out on Special Edition Blu-ray which you can read my review for it HERE. So the plot is 40 years later after the events which displayed themselves in the 1966 film Hawaii. In The Hawaiians you are introduced to new characters, a new generation. Your main character is Whipple Hoxworth simple known as Whip. He decided to come home to Hawaii, once there he learns his grandfather has passed away. Whip while in Guiana had stolen some pineapples. His purpose was to see if they could grow in Hawaii. Through the partnership of Wu Chow’s Auntie in allowing her to try and grow the pineapples. This would start and push forward the pineapple growth and business of pineapples in Hawaii. Then add in basic life, Whip marries, has a son, that relationship has problems, so does the relationship with his son. This film is a dramatic historical drama that transcends into a tale that you slowly follow unraveling in all its dramatic ways. Directed by Tom Gries. Gries was a director that died way to soon. He was only 54 years old. He had a natural talent in bringing stories to life no matter how complex or simple they were. He was able to capture the raw nerve of emotions on screen, both great and small. He not only was a director, but also a writer. He directed and wrote many moments in TV. From The Rifleman, Mission Impossible, Batman, I Spy. The real mastery of this director was what I consider one of his greatest works, and one of the best TV Miniseries films ever done, 1976’s Helter Skelter about Charles Manson, and to me is still considered one of the best True Crime films ever done. He also directed one of my favorite westerns, also starring Charlton Heston, 1968’s Will Penny. A heart attack took this brilliant director from the movie world, but he left a few shining examples of important pieces of film. Twilight Time has honored this director with a lovely new outlet to one of his films. This one is not as good as the first installment. It still has enough to bring the watcher in, allow the watcher to be entertained. The story flows with an ease and an understanding of watching life unfold on screen. The personalities of all the characters grow on you and in a sense you become a part of this island, the people, places, food, emotional reality. I felt the film succeeded in showcasing the reality of different personalities, cultures and island life. This film stars a wonderful cast of performers. The amazing one of kind film guru, master talented, Charlton Heston in your main role. Everything has already been said about this flawless genius. He has performed in some the greatest films ever created. Apart of so many masterpieces of film, that it’s shocking that one man could have graced the world of cinema like he has. It’s so sad knowing that this one of kind actor has passed away. I still find myself watching Charlton Heston films all the time. From the masterpiece The Ten Commandments and Ben-Hur, to the sci-fi brilliance of Planet of the Apes and Soylent Green. He is and will always be a master thespian. Also starring the wonderful, beautiful, masterly talented Geraldine Chaplin. She is such a performer that it’s hard to explain her mastery in words. I absolutely love her, have always loved her, and loved everything about her. She has such a golden talent that just shines off screen. Like her father the great legend of cinema Charlie Chaplin, she gives her all to cinema. Every part I have ever seen her in, she shines with ease and grace, in capturing that character she is playing. Also I have to mention actor Alec McCowen. Always a treat to see. He too has a talent that really can’t be expressed in words. You just have to watch him, and understand the brilliance of his talent. I have always believed he has never gotten the limelight he deserved. I think the shinning role of the film is Tina Chen. She brings to life her character. She makes you glued to her emotional reality. Her performance I feel is one of the strongest in the movie. One has to mention the breathtaking cinematography of the film. A double duo of brilliance by Lucien Ballard and Phillip H. Lathrop brought this film to gorgeous clarity. Some of the best imagery ever done for a film. A solid example of capturing beauty in imagery. Twilight Time has done another film justice. Giving a modern generation another important blu-ray of excellence. The Hawaiian’s is a film that might not be great, and doesn’t come anywhere near the brilliance of the first film, but it still maintains an importance in film making. A great film of imagery, acting, costumes, sets, and most of all story. Like most of these brilliant special edition Twilight Time films, there is a flawless reality to them when it comes to the video and audio departments. The Hawaiians is a beautiful example of how to treat a film, Clean it up, display it in a whole new setting. Crisp imagery. Vibrant colors. Sound crystal clear, equals the word flawless. Isolated Score Track. The all-important extra that most of these releases come with. The isolated score is something I always look forward to, mainly because I am a music fiend, but also I love film scores. Henry Mancini is a guru of music. He was a true treat to listen to. He composed so much in the music world. He passed away in 1994 but his music is still being used today on film and TV. Working on such greats like 1958’s Touch of Evil, 1961’s Breakfast at Tiffany’s, 1963’s The Pink Panther, 1963’s Charade, 1967’s Wait Until Dark, and some of my personal favorites, 1985’s Lifeforce, 1985’s Santa Clause, 1986’s The Great Mouse Detective, and countless others. Well over 300 films and TV. He was a true musician that left the world with a sound of beauty. Once again I find myself thoroughly entertained and in amazement at the high quality of transfer, and sound clarity on this Twilight Time Special Edition Blu-ray. Twilight Time never lets me down in experiencing high class examples of what one should strive to do in bringing out products. 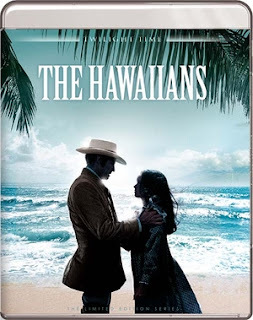 Twilight Time is a blessing, and an honor to the cinema world, and that is way The Hawaiians is another prime example of a great Blu-ray, that needs to be owned.